120 mm/50 Model 190510 х 1 pcs. 37 mm 70-K11 х 1 pcs. 12.7 mm DShK12 х 1 pcs. 37 mm 70-K5 х 1 pcs. 76 mm 81-K2 х 2 pcs. 12.7 mm Vickers2 х 4 pcs. 76 mm 34-K6 х 1 pcs. 37 mm 46-K1 х 4 pcs. Oktyabrskaya Revolutsiya — Soviet premium Tier V battleship. 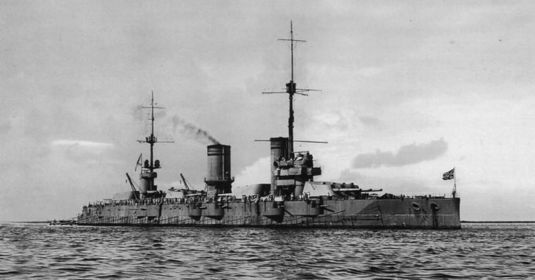 Until 1925, this Russian battleship was known as Gangut. Designed before World War I, the ship carried main battery guns that were good for her time. In the 1930s, the battleship was upgraded to receive more powerful propulsion, an advanced gun fire control system, and improved AA guns. Oktyabrskaya Revolutsiya ("October Revolution") is a Tier V Russian battleship that features twelve 305mm guns in a 4x3 turret setup. Being an early dreadnought, Oktyabrskaya Revolutsiya is relatively slow — moving at 23 knots in game — particularly given her engine upgrades that she historically received. However, she has strong armor that can resist a large amount of high explosive shells and is very strong at bouncing incoming armor piercing rounds shells. While her AA looks impressive with a long list of flak guns mounted aboard, it is not as strong as that found on Texas as it has less range and lower damage per second. Oktyabrskaya Revolutsiya Damage Control Party ( ) consumable is her most unique ability. It has an extremely fast cooldown, but trades this for limited charges like most other consumables. This allows Oktyabrskaya Revolutsiya to deal with situations which would put an unrepairable DoT on her, but can leave her in danger of running out of charges, meaning that one must carefully choose when to use this consumable, even with its fast cooldown. Captains familiar with Imperator Nikolai I will find Oktyabrskaya Revolutsiya of a similar play style, with nearly identical main battery guns and the addition of decent anti-aircraft armament. Has access to a unique Damage Control Party ( ) consumable, which reloads very quickly but has a limited number of uses. Armor scheme means that most high explosive shells will not penetrate a majority of the ship's hull, and that angling will mitigate damage taken from armor piercing shells. Strong short range AA, which will make most aircraft carriers wary of approaching Oktyabrskaya Revolutsiya. Third fastest Tier V battleship (23 knots) behind Kongo and Giulio Cesare. Main battery guns are pretty accurate for Tier V.
All but invulnerable to damage over time effects like fires and flooding due to the unique Damage Control Party consumable, so long as it has charges left. 12-inch main battery AP shells decimate broadside cruisers. Has low health pool for a Tier V battleship. Only Bretagne has less. Guns are lackluster against higher tiered opponents, particularly battleships. Armor stops working when the ship is full broadside. Her citadel is particularly vulnerable. Her unique Damage Control Party ( ) consumable is capable of running out if used too many times. Secondary armament shouldn't be counted on to accomplish much. Higher-tier battleships — particularly Colorado and Nagato — can easily citadel Oktyabrskaya Revolutsiya when she is broadside. As a Premium ship, Oktyabrskaya Revolutsiya doesn't have any upgrades to research. Slot 3 offers two viable upgrade options for Oktyabrskaya Revolutsiya. Aiming Systems Modification 1 reduces the total shell dispersion by 16 meters and provides slight increases to the range and accuracy of the secondary battery. Alternatively, Main Battery Modification 2 ( ) may be mounted, which decreases the turret traverse time by 5.1 seconds. However, mounting this upgrade will increase the reload time of the main battery by 1.6 seconds. Oktyabrskaya Revolutsiya, unlike other ships, has a special Damage Control Party ( ) with limited uses — much like Repair Party ( ) — starting at a base 3 charges, which can then be increased by the skill Superintendent and/or equipping the premium version of Damage Control Party ( ), Damage Control Party II ( ). It has only 30 seconds of cooldown before it can be used again, with the premium version having only 20 seconds of cooldown. 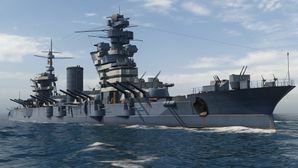 However, players may find themselves at risk when they run out of the Damage Control Party ( ) consumable, especially when they are facing enemy destroyers and cruisers armed with torpedoes, as flooding can do severe damage to battleships. Fires may also seem tempting to quickly put out upon being set on fire, but players must be wary that the consumable has limited charges. For this reason, Oktyabrskaya Revolutsiya captains should always invest in Damage Control Party II ( ). As a Premium ship, Oktyabrskaya Revolutsiya comes included with Type 9 camouflage that lowers her detection radius, reduces the accuracy of incoming shells, decreases service costs, and increases the amount of experience she earns. An event shortly after the battleship's launch awarded captains who completed it with Krasny Oktyabr camouflage, which, while operationally identical to the Type 9, covers the ship in vibrant red and orange patterns. Oktyabrskaya Revolutsiya, as a Battleship, is able to mount 8 signal flags simultaneously. Captains should mount India Delta ( ) and November Foxtrot ( ) flags to improve the effectiveness of the repair party consumable. Mounting India Yankee ( ) flags is also recommended to reduce damage taken from fires. Sierra Mike ( ) flags can also be equipped to increase the ship’s top speed. Lastly, economic and special signal flags can be mounted to further increase the experience and credit gain per battle. Oktyabrskaya Revolutsiya fires a fatal salvo at an enemy Bayern. Flag of Oktyabrskaya Revolutsiya. Given to players who purchased a special bundle containing Oktyabrskaya Revolutsiya. Imperial Russian battleship Gangut at anchor in Helsinki, Finland, 27 June 1915. At the direct behest of Tsar Nicholas II, the Imperial Russian Naval Staff commenced work on designing a novel dreadnought class for the Navy upon the unveiling of HMS Dreadnought in 1906. By 1908, the design requirements were finalized: the class had to possess speeds greater than 21 knots, and carry no less than twelve 12-inch guns. Due to a lack of native shipbuilding experience in Russia, tenders were sent out to foreign companies and a winner selected from over 50 contestants. The Naval Technical Committee chose the proposal sent by the German firm Blohm & Voss; unfortunately, Russian and Germany had become belligerent rival states and such a move was seen highly unfavorably in the eyes of the Russian and French governments. As such, the Navy decided to just buy the blueprints, and – with British technical assistance – got the Baltic Yard in St. Petersburg tooled up to start construction on Russia’s first dreadnought: the Gangut-class. Immediately apparent in her silhouette was the placement of her artillery in 4 triple-turrets, all mounted along the centerline. In this era of dreadnought construction, this was a revolutionary design choice that allowed for the ships to use every 12-inch gun at their disposal for any broadside. Compared to her British and German counterparts, Gangut could hurl about 30% more weight per broadside salvo. What was less ideal was the placement of the casemates for the secondary guns; positioned right beneath the broadsides of each turret, they would frequently be disturbed when the main guns would fire. Due to the location of the main battery turrets, the placement of machinery spaces was hampered as well: the fire-rooms with the boilers were situated around B turret, whereas the turbine rooms were placed aft of Y turret. With British assistance, the Russians were able to procure Yarrow boilers for the Gangut-class, which were much more efficient than the Belleville boilers that were currently in service with the Russian Navy at the time. The improved boilers increased projected speeds by about 2 knots, allowing for the class to be faster than its contemporaries. Other interesting design choices considered were a bow capable of ice-breaking and U.S Navy-style lattice masts; the latter were rejected due to vibrational instability. On the other hand, compromises had to be made. Just like battlecruisers of the era, Gangut had to sacrifice on protection in order to improve speed. Further complicating matters, experience from the Russo-Japanese war showed that armor belts had to extend wider than had been previously thought. Unfortunately, this meant the belt was thinner overall; in certain cases the belts on the Gangut-class ships was 1-3” thinner than their foreign contemporaries. Some novel design considerations were implemented to offset any deficiencies; longitudinal bulkheads were placed some distance behind the belts in order to catch any AP shell fragmentations that managed to penetrate the belt. While the design phase of Gangut’s construction progressed relatively smoothly, the construction phase was anything but. Although the military and the Tsar were enthusiastic about such a building program, the Duma was less so. Such a project required an amount of high-tensile steel that was unprecedented at the time for Russian shipbuilding. Various other factors compounded to result in construction being stretched out over several years, to the point that foreign navies were already in the process of designing dreadnoughts that would outclass Gangut by the time she was launched. Oktyabrskaya Revolutsiya (ex. Gangut, renamed in 1925), the lead ship of the class, was laid down at the Admiralty Shipyard in Saint Petersburg, on 16 June 1909. She was launched on 20 October 1911. The Gangut-class underwent a major reconstruction phase during the 1930s. The ships were modified with a clipper bow that extended up to an enlarged forecastle deck. The superstructure was rebuilt to include an enlarged bridge and improved fire-control directors. The forward funnel was raised and tilted aft. Additionally, aviation facilities and improved AA armaments were installed, and oil-fired boilers replaced mixed-fired ones. Oktyabrskaya Revolutsiya had turbines meant for battlecruiser Ismail installed aboard instead. Commissioned as battleship Gangut into the 1st Battleship Brigade of the Baltic Fleet on 11 January 1915, Gangut joined her sister-ships Sevastopol, Petropavlovsk, and Poltava spending 1915 performing distant cover for minelaying duties in the Baltic, never sailing further into the Baltic than the shoreline of modern-day Latvia. She spent the entirety of 1916 idling in the port of Helsinki, then under Russian rule. Her idle sailors joined the rebellions during the February Revolution in 1917, leaving the ship undermanned as her sailors drove the Tsar out of St. Petersburg. As the internal situation of the Russian Empire rapidly began to disintegrate, the provisional Russian government signed the Treaty of Brest-Litovsk with the Central Powers. Part of the treaty required Gangut and the Russian fleet anchored at Helsinki in March 1918 or have the now-independent Finns intern them, even though the Gulf of Finland was still frozen over. Gangut and her sisters managed to escape to Kronstadt in mid-March, in a trip that later became known as the “Ice Voyage”. As the Soviets drove the White Russians loyal to the Tsar out of Russia, Gangut was laid up in early November 1918, having essentially run out of men as her sailors joined the fighting in the homeland. Following the Soviet victory and the establishment of the Soviet Union, Gangut was not reactivated until the mid-1920’s, renamed Oktyabrskaya Revolutsiya (in honor of the October Revolution of 1917) in June 1925. She was partially modernized from her reactivation until July 1926, when she re-joined the Baltic Fleet. Her duties henceforth were nothing more than training exercises, until she returned to the Baltic Works in St. Petersburg (then Leningrad) for a more extensive modernization. She returned to the Baltic Fleet again, resuming training exercises until the outbreak of the Winter War in 1938, where she bombarded Finnish coastal batteries in December 1939 before the Gulf of Finland froze over, preventing further naval support. She sailed to Tallinn shortly after the Soviets occupied Estonia, receiving another minor modernization in 1940. Upon the German Invasion of the Soviet Union, Oktyabrskaya Revolutsiya was still in Tallinn, and was forced to sail to Kronstadt by the invading Germans. In late September 1941, direct aerial bomb hits knocked out her two front turrets, forcing her to return to besieged Leningrad for repairs; she returned to service in November 1942. Much of her wartime service was repeated fire support missions against the Germans besieging Leningrad, until the siege was finally lifted in January 1944. Oktyabrskaya Revolutsiya supported the Leningrad-Novgorod Offensive that month, and the Vyborg-Petrozavodsk Offensive in June 1944. For her service, she received an Order of the Red Banner in late July 1944. What happened to Oktyabrskaya Revolutsiya in the period between 1944 and 1954 is largely unknown, as the only major records remark upon her radar upgrades. She was reclassified as a “School Battleship” for training uses in 1954 and was later stricken in February 1956, being slowly broken up over the next several years. By 1959, she had ceased to exist. Oktyabrskaya Revolutsiya in 1934, after her modernization. Oktyabrskaya Revolutsiya after her final modernization refit, late 1930s. Luftwaffe aerial photograph of the damaged Oktyabrskaya Revolutsiya in Kronstadt, 23 September 1941. Oktyabrskaya Revolutsiya post-war, with crew manning the rails. Chesneau, R., Gardiner, R. (1980). Conway’s All the World’s Fighting Ships: 1922-1946. London UK: Conway Maritime Press. Sturton, I. (1987). All the World's Battleships: 1906 to the Present. London: UK: Conway Maritime Press. McLaughlin, Stephen (2003). Russian & Soviet Battleships. Annapolis, MD: Naval Institute Press. This page was last modified on 6 October 2018, at 08:52. This page has been accessed 86,122 times.